Hello friends! We are nearing wedding season. I have been looking on Pinterest at wedding cakes. We have a wedding coming up this summer in my family and I have turned my attentions to wedding decorations, cakes, flowers, clothing, etc. I needed some mini wedding cakes for tabletop decorations – I decided to use Smoothfoam and my hot wire foam cutter to create some of my own. 1. Cut three pieces from the Smoothfoam block (1″ thick) – 3″ square for the bottom layer of the cake, 2-1/2″ square for the middle layer and a 2″ square for the top. 2. Mix two drops of paint into a quarter cup of modeling paste and blend thoroughly with a craft stick. 3. Use a skewer as a handle by poking it into each block of foam. Brush each piece with the tinted modeling paste and stand the skewers in a jar to dry thoroughly. 4. Attach the three cake layers together with toothpicks and secure with hot glue. 5. 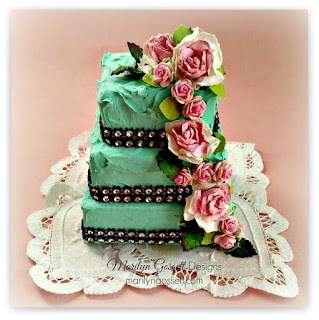 Decorate your cake with the paper flowers, leaves and rhinestone trim – or try mini pearls, ribbon, jewels, or glitter. This entry was posted in General Crafts and tagged Block, Blue, Tabletop, Wedding by Marilyn Gossett. Bookmark the permalink.